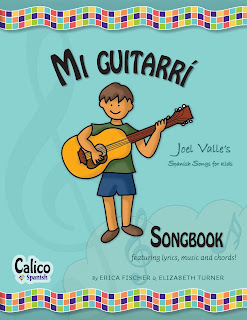 Have you been enjoying your Mi guitarrí: Spanish Songs for Kids CD? Do you wish you knew the guitar chords so you could play along with Joel? Do you wonder how to play the melodies to these terrific tunes on piano? Are you looking for a convenient way to reference the English translation of the fabulous lyrics? Do you long to see more of Courtney’s cheerful artwork? Do love quality Spanish resources for your children and students? If you answered yes to any of these questions, you’ll be happy to hear that our Songbook will be published soon. We’ve been working hard to bring you another fantastic resource. Keep checking back to learn when our Songbook is ready for retail sale. We look forward to sharing with you!